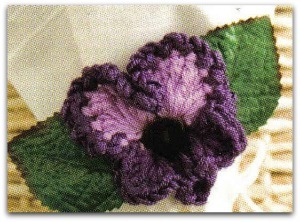 This "Pansy" flower crochet pattern is another easy and pretty pattern. Instructions With black, ch 2. Rnd 1: 10 sc in 2nd ch from hook; join in first sc. Change to light purple by drawing 1p through; cut black. Rnd 2: Ch 1; in same sc as joining work (hdc, 2 dc, 3 tr, 2 dc, hdc)—large petal made; sk next sc, in next sc work (hdc, 2 dc, 3 tr, 2 dc, hdc)—large petal made; change to dark purple by drawing 1p through; cut light purple; *sk next sc, 9 hdc in next sc—small petal made; rep from * twice more; join in first hdc. Rnd 3: *Ch 2, sI st in next st; rep from * 16 times more; join in first hdc of next small petal. Fasten off and weave in all ends. Referring to photo for placement, glue leaves to back of pansy.